Reading over their website you can easily see they take photo printing seriously and want to make sure they can take care of a variety of needs and ensure customers receive only the best..
Posterjack’s online photo printing service offers the largest variety of photo art products in the country. Want to print your photos on acrylic? No problem. Looking for metal prints? Yup, we do that too. Even better, all of our products are handmade in Canada with exacting quality, vibrant colours, and dazzling clarity. That's why our awesome customers keep coming back to The Photo Art Experts for canvas printing, custom framing and more. Have fun! We had a hard time picking just one photo from our photo shoot, so we ended up choosing to make a collage printed on Canvas with four of our favorite pictures. While we didn't use these options, you can even choose from background images and even add text to your collage. This would be a perfect way to display vacation photos! The process to create our collage was straightforward and the site provides instructions and prompts as you go to assist with making choices and creating your print. Posterjack can also help you out in the gift department too! A quick look at their Holiday Shipping info http://www.posterjack.ca/shipping.php told me that there is still time to upload your photos and create a gift for someone special on your list. Order deadlines will depend on what you are ordering, but if you can’t decide in time they have gift certificates too! 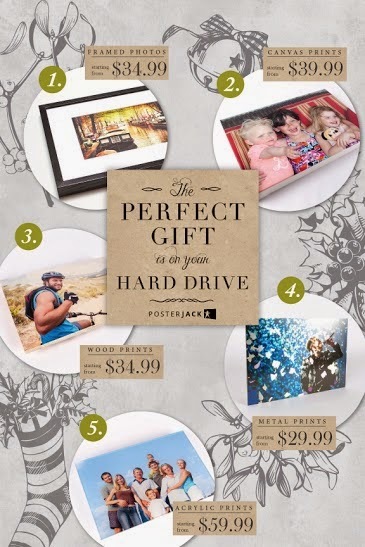 With Posterjack's simple process there is plenty of time to do some last minute shopping. Simply upload your image, choose your printing medium, size and with a few more clicks of your mouse you are ready to go. The great part, no matter what size you choose shipping is a flat rate of $8.50 within Canada and free with orders of $150 or more! After placing my order last night I can already think of some things I would like to order in the future. I am very interested in the other mediums they have such as wood, acrylic and even metal. I was not aware that you could get pictures printed on metal before now. So don’t delay, head over to check out Posterjack.ca today for your printing needs. You can also check them out on Facebook and Twitter. Leave me a comment and let me know what would be the first thing you would get printed from Posterjack? Would it be a gift for someone or simply something to deck your own walls with? I received product in exchange for this review. As always views are my own and are not influenced in any way.